Kent-based Ecolution Energy Services has announced that it is to add a range of inverters from GoodWe (Jiangsu) Power Supply Technology Co Ltd to its stock holding. Ecolution will be featuring the inverter range on their new solar e-commerce website www.ecolutionproducts.com. 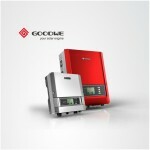 GoodWe has developed a full-range inverter package designed to suit the broad customer requirements across world markets: the SS (single-MPPT, single-phase); the DS (dual-MPPT, single-phase); the DT (dual-MPPT, three-phase); the DI (high-frequency isolated); the PB (inverter with battery); JP (for the Japanese market) and MT (central) solar inverters, ranging from 1.5 to 500kW.